Hydra-Capsule have been designing, manufacturing and using remote and real-time monitoring jacking systems since 1987 for the use within the civil and construction sector. Ranging from bridges, superstructures to prestigious buildings, and for projects where integral support monitoring is required. Our monitoring systems offer economic, purpose-built displays and computerised control monitoring allows for a total solution in controlled hydraulic movement for carrying out lifting, lowering and sliding operations. 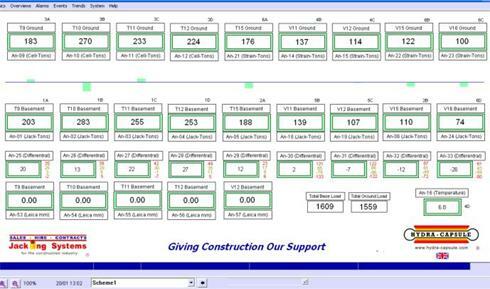 All our jacking monitoring systems have be developed over major projects and are 100% designed and developed in-house. 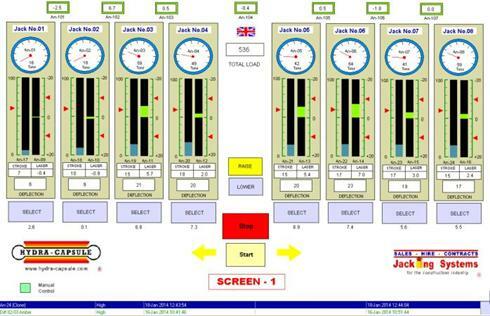 The system is designed for the robust environment of the construction industry and the ease of visual displays, to computer displays allows all parties to have a comprehensive understanding of all jacking operations. 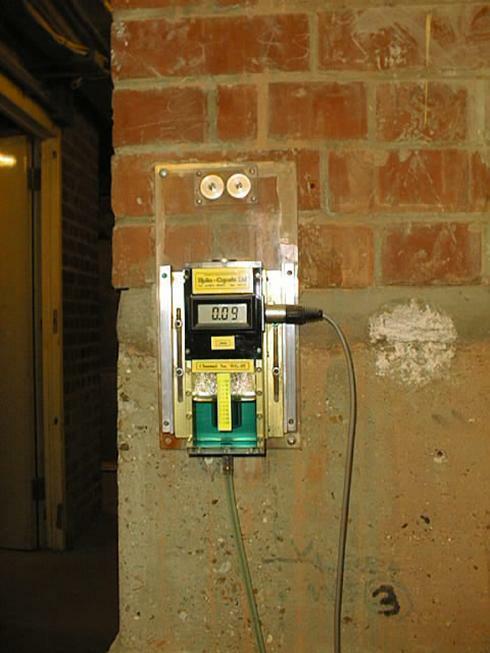 Our system can monitor and control any number of hydraulic jacks. Which can be designed and adapted to incorporate all jacking operations and solutions. Our monitoring systems has the ability to monitoring multi-sensor data from hydraulic jacks’ pressures, displacement instrumentation, to temperature and geodetic monitoring all returning back to a central control unit. All the information is stored within our sophisticated data-loggers that can identify information and extracted to develop trend graphs, excel data and chart information. The system can beset in real-time or defined time periods to record data; which in turn, can has trigger limits and alarms programmed to notify defined key personnel via SMS text message or alarm-email. The current monitoring software allows all information to be transferred to a secure a web-based viewer interface site. So can be access remotely, using the Website IP address and password to access all the project’s monitoring data. This allows Hydra-Capsule to provide the necessary service to implement remedial action to the existing structure, hydraulic jacks or temporary propping system, providing a comprehensive contract package.